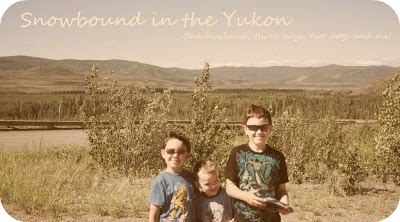 Snowbound in the Yukon: Lazy summer days??? I've been trying to get into a writing frame of mind but it's been hard. The days have been hot and busy, with the exception of a couple of days. Hubby was super busy at work for three days and then it started to rain but they already planned to have someone come up to help him, instead they just covered for him so he got two days off and was home for the most part with his family. It was really nice to see him around so much. He did sprain his ankle and it was pretty swollen but I guess still walkable. I later twisted my ankle and his hurt for a bit but not the whole day. Mickey got a new balloon. Daddy brought him a red one and it was his new best friend for a couple of days before big brother popped it. Mickey was pretty mad at his brother. Mickey has been in his potty training mode where he just uses the potty when he wants and it was going great, he did 6 or 7 days straight with no accidents, I lost count. With hubby home on Tuesday we went and got sand from one of the pits across the river and filled up two buckets to bring home. The boys enjoyed the ferry ride and the little adventure. We also got a small Little Tykes climber from a friend. The kids were playing non-stop in the sand and then Mickey had his first accident, a number two that was yesterday I think and then he did it again today, he hid in the bottom part of the climber but the little guy came in took off his pants and dumped it in the toilet and started the shower. He's quite the character! He's really trying to talk these days and it's getting good some times. I'm quite happy with everything with him for the most part. We walked and swam and put up the netted tent, so we can all enjoy outside now. SmartGuy is in swimming lessons this week and next week and really enjoying it. He doesn't want to get out of the water. I was worried when he started about his cold uticaria because the allergist said that swimming would mostly likely be the cause of it, since his whole body is submerged in the water, so when he gets out and his body is warming up his body will be given the signal that there is something to ward off and his whole body would release histime and give him hives. So far only the first two times did he get a bit of hives on his ears. He did get hives in our outdoor wading pool because the water is so very cold. His behaviour is doing pretty good, he stills has trouble listening but I'm working on differnt techniques. We went out walking one day and he was on his bike. I told him to stop at each road, well we came to an alley and he didn't stop right away and a truck was actaully coming out of the alley and he was nearly hit. It was a scary because he knew then that he had to stop at each road and look for traffic. He did much better after that but boy oh boy, it sure could have ended differently. It's a good thing I make sure he has his helmet on at all time on his bike. I bought two books called Positive Discipline. One night after a nerve racking day and I got online and found some books that were highly recommended. So far they sound really good and I'm only on page 10 right now. They are two books by Jane Nelsen. "The classic guide to helping children develop self-discipline, responsibility, cooperation and problem-solving skills." I can't wait to finish reading it and start using some of the steps. One day at a time. On one day this week we cleaned up some junk around the yard and house and took it to the dump and free store. It was nice to get rid of some things. SmartGuy loves going and I had my mom look after the two youngest. SmartGuy did some home with a really nice shirt and a hoodie and a couple of dinosaur toys and I picked out a desk from that used to be in the schools. I remember those desks from when I was in school, so that was neat, I just have to give it a good cleaning. Bugaboo has been having an awful time lately. I don't know if it's the heat or teething or something else but he's not been a happy camper. He doesn't like going in his jolly jumper or activity center when I'm trying to get things done like prepare meals for the boys or clean my house. So not much has been done lately around here. I did manage to do a little cleaning today when I had some respite not much but enough to get me started and the ball rolling. I'm also wondering since I started giving Bugaboo solids, just rice cereal and bananas, if his tummy is sore and not agreeing with him. I think I may stop and see for a few days and wait until he's actually 6 months in two weeks time. And then start again. He's finally getting the hang of the sippy cup and really enjoys banana in his feeder. The feeder is a mesh covered holder, that the baby can chew on without getting chunks just the mush that comes through the mesh. He stills enjoys tummy time and is moving all over the place. He's almost got the knees up and arms up at the same time and I think one thing that is making him upset is that he can't run after his brothers, I see the longing in his eyes and body language that he wants to move and get going. He did enjoy being outside today, we brought his activity center outside so he coudl see his brothers playing in the sand box. Me? I'm good for the most part. Still managing to get some sleep, because I keep falling early but not tonight. Also still managing to get some pilates in but I really need to do more cardio. I'm struggling to quit smoking again and hopefully I can kick it again. I mean I'll kick it again in no time at all. Hoping to do more walking this week, well over the next few weeks, the triathalon is in just over a month and a half. I'm keeping busy with the boys, doing lots of stuff. I'm trying to keep positive and remind myself to take it one day at a time. A friend recently got me this great gift, it's a new cutter system for scrapbooking. I love it, I haven't used it yet but I will. So thank you, thank you again. H It was so thoughful. This weekend is the cake decorating workshop, I can't wait, I'm going to bake a cake tomorrow for it. I have my twin cousins lined up to watch all three kids. I just hope i can pump some milk. He wasn't too fond of the formula!